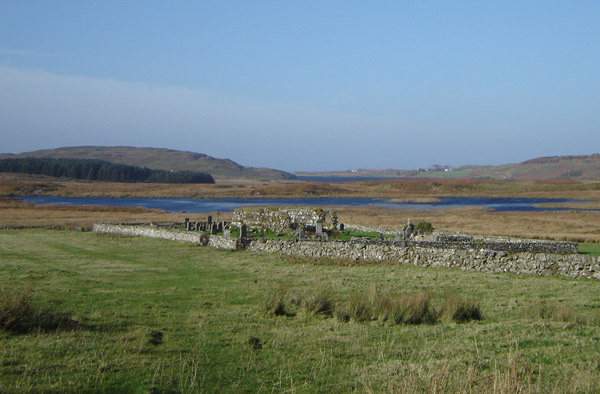 This ruined Old Parish Church lies south east of Bunessan between Loch Assapol and the sea. It is accessed via a gravel road at the end of which is parking space. Leave the A849 and turn onto the Scoor Road a short distance west of Bunessan School. Follow the road along the east side of Loch Assapol. Just past the entrance to the Water Treatment Works the tarmac ends and the road becomes a stoney track. Continue to follow the track along the side of the loch until you reach the Visitors Car Park. The remains of Kilvickeon Church can easily be seen to the right (south-east). There are then two gates to go through. PLEASE KEEP THE GATES CLOSED AS THERE ARE SHEEP GRAZING IN THE FIELDS. It can be muddy! DEDICATED TO: Ernan, son of Eoghan nephew of St Columba. In 15th century it was known as St Eugenius in Ross. 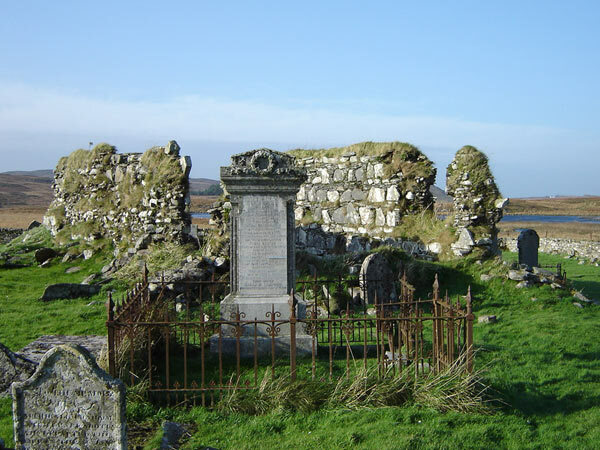 Kilvickeon translates from Gaelic as Church or Burial Ground of the son of Eoghan. 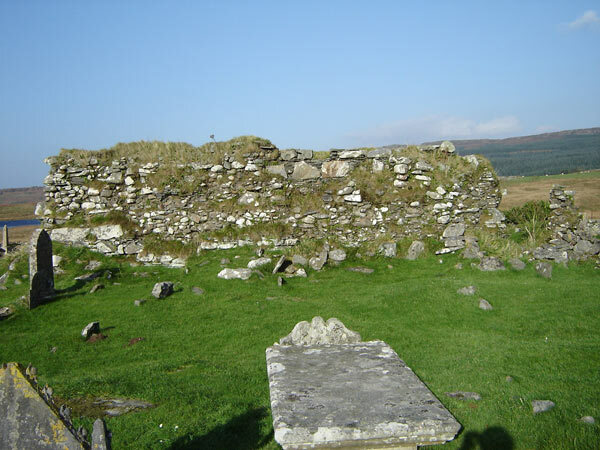 STRUCTURE: Its architecture is similar to that of St Oran’s Chapel on Iona. It is built of local stone slabs and boulders and bonded with many small pinnings. Many of the larger stones have been set on edge, which has been the cause of the collapse of much of the outer face work on the south wall. There is some evidence that the external wall-faces were harled, and buff-coloured sandstone, probably from Carsaig, was used to dress the stone. Several prominent stone thatch-pegs can be seen on the north wall suggesting that the original roofing was of thatch. These would have helped in tying down the thatch with ropes in the frequent gales and storms. The entrance to the church, an archway, was on the north side and the door could be secured by a draw-bar, the sockets for which can be seen in the right hand wall as you enter. The entrance archway was largely intact until late 2011, when it began to crumble. In early 2013 a great deal of restorative work was done on both it and the remaining walls to reinforce and stabilise them. On the left of the entrance, about a metre above eye-level, is a very worn piece of carved sandstone believed to be a ‘sheela-na-gig’. There is controversy about the origins of sheela-na-gig carvings. One school of thought has them originating in France or Spain in the 11th century and arriving in Britain and Ireland in the 12th century. This is based on research suggesting that most surviving sheela-na-gigs are in areas of 12th century Anglo-Norman conquest. Others think the carvings are remnants of a pre-Christian Fertility or Mother Goddess religion. They point to differences in materials and styles of some sheela-na-gigs from their surrounding structures, and that some are turned on their sides, supporting the idea that they were incorporated from previous structures into early Christian buildings. Many surviving sheela-na-gigs are found in Ireland. This is one of only five still in existence in Scotland. The Iona Nunnery has another. Whatever their origins, they were believed to ward off evil and death. Windows can be seen opposite each other on the north and south walls. Two further windows may have existed on the east and west walls. In the nave, until recent years, there was a late medieval grave-slab (1500 – 1560) with an inscription beginning HIC IACET MA/RIOTA [FIL]IA .. ‘Here lies Mariota, daughter of ……’. 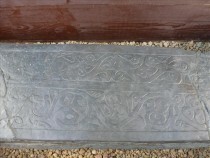 This was a handsome, tapered, slate slab with a foliate cross and inscription at the top, and two plant scrolls topped by animals in the lower half. 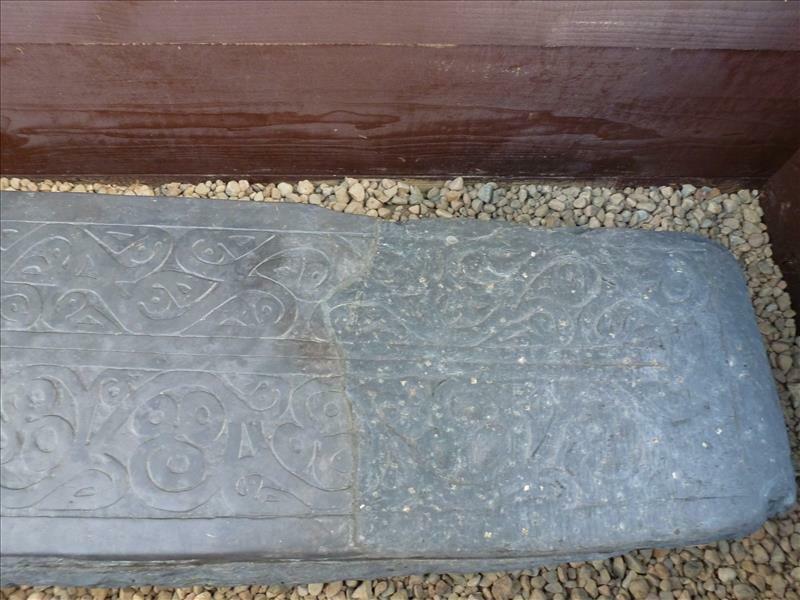 It is fortunate that the stone was recorded by the RCAHMS, because it was first damaged and then stolen. 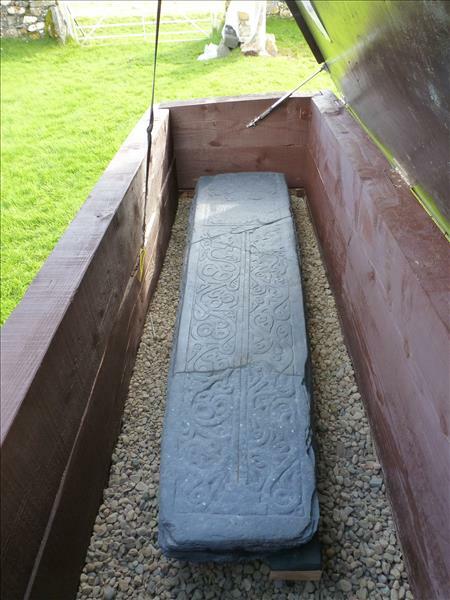 A replica is now displayed in a protective housing just inside the entrance to the graveyard. It will not be returned to its original position in the nave, but the depression left by the removal of the stone can still be seen against the south wall of the nave. 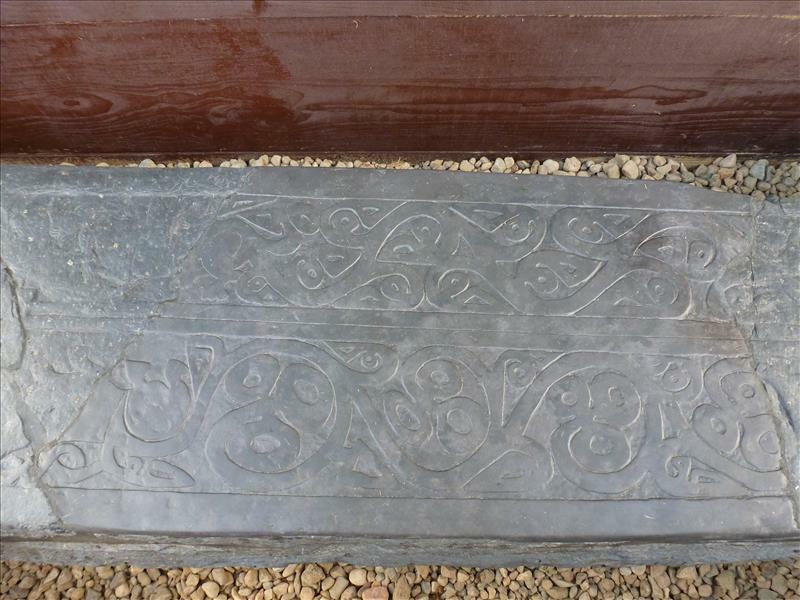 It has been infilled with a wooden plaque to ensure that the original position of the stone is not lost. GRAVE YARD: The current grave yard is roughly oblong in shape, but the original burial ground would have been a more relaxed oval area, as was common for medieval burial grounds. Traces of the old shape can be seen in the south-west corner where a curved rise in the ground marks the old boundary. It is not known when the modern oblong shape was established — ? 18th century — and there has since been a further extension on the east side, which houses more recent graves. Again, a rise in the ground running north from the west side of the gate across to a large grave enclosure marks the line of the previous wall. There is evidence of an earlier gate in the south wall, the current gate being in the more recent extension. 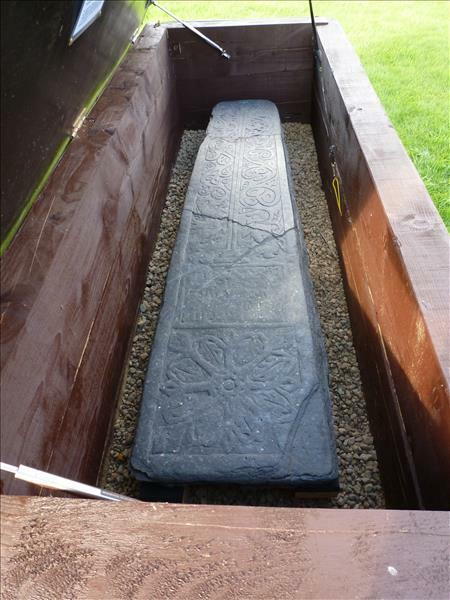 The grave-yard is full of interesting and varied grave stones bearing different emblems and local family names, including those of Macnevin, McNeil, McPhail, McGillivray, Macdonald, Mackinnen, MacLean and Cameron. They date from medieval to post-reformation and the most recent stone is dated 2002. 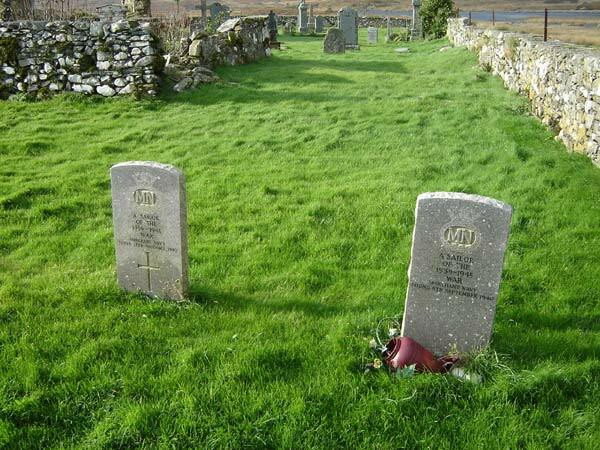 One notable person buried here is Colonel Archibald Maclean of Scoor, ‘a man and a soldier whose deeds of gallantry in campaigns that made the British Empire will ever be dear to the hearts of his countrymen’ (quoted from Rev. J W Macphail’s Handbook To the Islands of Mull and Iona and Adjacent Islands). The former farmhouse at Scoor, which is visible from the grave-yard, was where the Colonel was born and died in 1817. A variety of occupations are also recorded on the stones – cattle dealers, cartwright, sailors, merchant, colonial service. In the east corner near the outer wall are two grave stones to unknown merchant sailors who died during the 2nd World War. 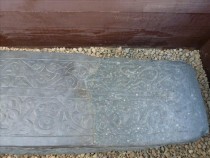 Several of the stones have been blown down and many have their inscriptions and embellishments worn away or covered in lichen. 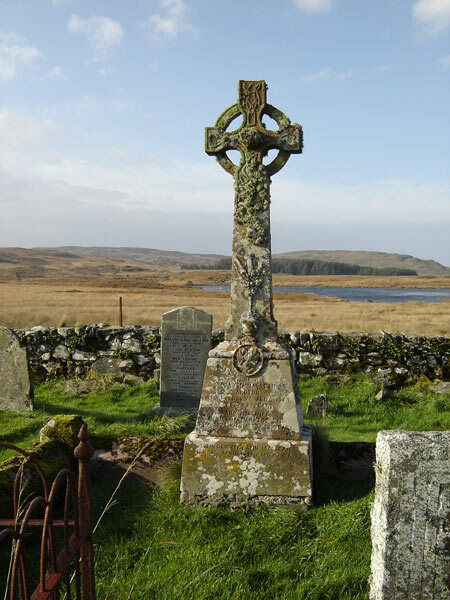 HISTORY: The church is thought to have been built on an earlier Christian site and is known to be one of seven medieval parish churches of Mull. It is contemporary with Pennygown and Inch Kenneth. Little is known of its early history. From the reformation onwards (1560) the parish was united with the other Mull parishes to form a single parish. Subsequently, that parish was broken down again and the area became part of the United Parish of Kilninian and Kilcolmkill. Around about 1720 the parish of Kilfinichen and Kilvickeon (more commonly known as the parish of the Ross) was formed. 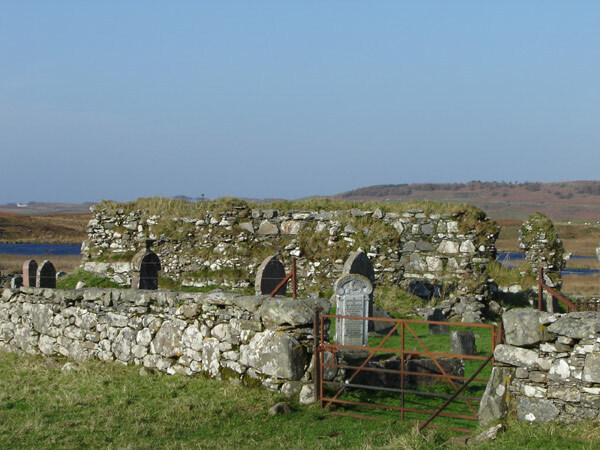 Kilvickeon was the parish church, supporting the entire population of the Ross of Mull. In 1791 the present incumbent, Mr Dugald Campbell, had 3002 people living in his parish and he noted that none were ‘Jews, negroes, gypsies, foreigners or persons born in England, Ireland or the Colonies’. Mr Dugald felt ‘his flock were sober and industrious’ (see p. 348 of Mull the Island and its People – Jo Currie). He is buried in the east end of the grave yard with his daughter, but the tomb stone and surrounding wall are in disrepair and it is difficult to read the inscription. 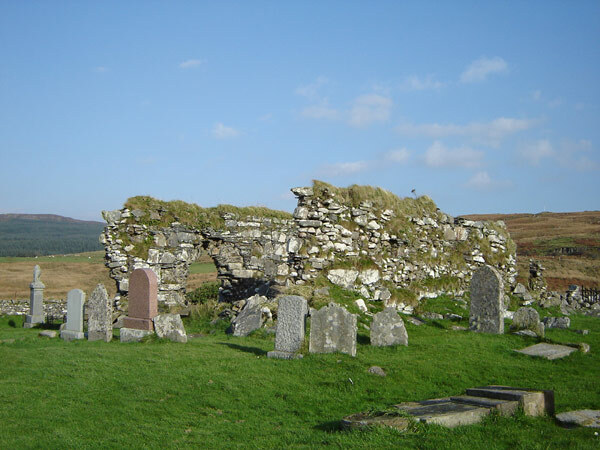 By 1795 the fabric of Kilvickeon church was falling apart and although it was still being used and is occasionally used today, a new church was built in Bunessan in 1804. Heritors (landlords) were often reluctant to repair churches on their land and the weather was also a contributing factor. 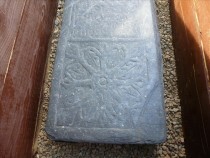 When the new church was built in Bunessan some of the stones from Kilvickeon were used.